Keep your cables neat and organized. 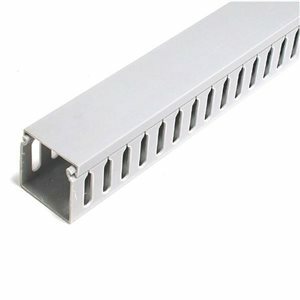 This two-piece plastic wiring duct provides a protective channel for cables, letting you route cables more neatly and in turn prevent the mess and confusion of tangled cables.The duct/raceway can be screwmounted, and features parallel openings along the length of the duct and a snap-lid design that provides easy access to cables while maintaining a tidy, organized appearance. This two-piece plastic wiring duct provides a protective channel for cables, letting you route cables more neatly and in turn prevent the mess and confusion of tangled cables. The duct/raceway can be screwmounted, and features parallel openings along the length of the duct and a snap-lid design that provides easy access to cables while maintaining a tidy, organized appearance.